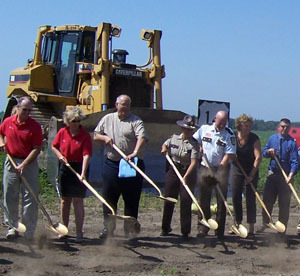 Relocating the highway south of Waseca is a key element in the reconstruction of Hwy 14, one of the state’s major east-west highways. The project extends from Waseca County Road 2 east to the Waseca/Steele county line, and will create 10 miles of new, four-lane highway. Valued at $56.2 million, the project includes grading, paving, building 10 bridges and constructing new interchanges with County Road 2 and Hwy 13. The project also includes mill and overlay work on Hwy 13 in Waseca and relocating District 7’s Waseca truck station. Mankato District officials said the work will take three years to complete. In 2009, the Rochester District will begin reconstruction of Hwy 14 in Steele County from Waseca to Interstate 35 in Owatonna. That project will be completed in 2012. In remarks made at the groundbreaking, Jim Swanson, Mankato district engineer, said this project and the one that begins next year between Waseca and Owatonna will mark the completion of a decades-long effort to rebuild Hwy 14 from New Ulm to Rochester. Rochester/District 6 officials expect repair work on 15 gusset plates on the Hwy 43 bridge in Winona will be completed by the end of July. The repair work is now under way. 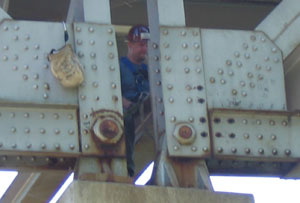 The bridge was closed to all traffic on June 3 when inspectors found many of the bridge’s gusset plates were rusted and corroded. The bridge, which carries traffic over the Mississippi River, was reopened to cars and light trucks on June 14. Traffic is now restricted to one lane during daylight hours to allow crews full access to areas needing repair. Heavy vehicles such as semitrailers will be allowed to use the bridge when the repair work is done. In addition to the plates, the contractor will also repair the bridge’s sidewalks so it can be reopened for bicycle and pedestrian use. Contractor for the $108,200 project is Edward Kraemer & Sons of Burnsville. “We’re pleased that the work is in progress; we’ll be even more pleased when the contractor finishes the work on schedule,” said Craig Falkum, district bridge engineer. Bradley (Brad) Johnson, facilities management supervisor with Duluth /District 1, died July 12 when the aircraft in which he was a passenger crashed on the Kenai Peninsula near Anchorage. Johnson was vacationing in Alaska at the time of the crash. Johnson was assigned to the district headquarters in Duluth where he served as the district’s building and facilities supervisor. Johnson had served with Mn/DOT since 1988 when he started as a bridge worker with District 3 in Baxter. He transferred to the Metro District in 1997 where he served as a transportation specialist and as a supervisor for a seasonal work crew. In 1999, Johnson was promoted and transferred to District 1 as a bridge maintenance supervisor. He was appointed as building facilities supervisor in 2002. Before joining the agency, Johnson worked in the construction industry as a mason, welder and heavy equipment operator. In 1984, Johnson earned a bachelor’s degree in mathematics and physics from the University of Minnesota-Morris. A Brainerd native, Johnson lived in Cloquet with his family. Johnson’s survivors include his wife, Carol Johnson, their children Lucas and Carleen, a brother and a sister. Visitation will be held July 20 from 5 p.m. until 8 p.m. at the Handevidt Funeral Home, 900 Washington Avenue, Cloquet. Visitation will also be held from 10 a.m. until the 11 a.m. funeral service at Our Savior’s Lutheran Church, 12th Street and Doddridge Avenue, Cloquet. Johnson, Hill said, would learn anything he needed to do his job better and was respected and well-liked by the people he supervised. Mike Robinson, district engineer, said Johnson exemplified leadership and customer service. "Brad Johnson was one of the most popular people in the district,” Robinson said. “He gave us all outstanding customer service no matter what issue we put before him. Not only was he highly technically skilled, he always gave people the attention they needed. “Brad also provided outstanding leadership to his crew. “Also, we have a very strong relationship with the State Patrol in our district, partly because of Brad's skill in resolving building issues in facilities that we share. Brad was instrumental in maintaining that relationship. “We will all miss Brad's good work, smile and friendship,” he said. Steven (Steve) Maack, an engineering specialist at Detroit Lakes, died July 14 at his home in Elizabeth, Minn.
Maack served the district as a supervisor in property management and permits. Maack joined Mn/DOT in 1990 as a highway technician with the Metro District. 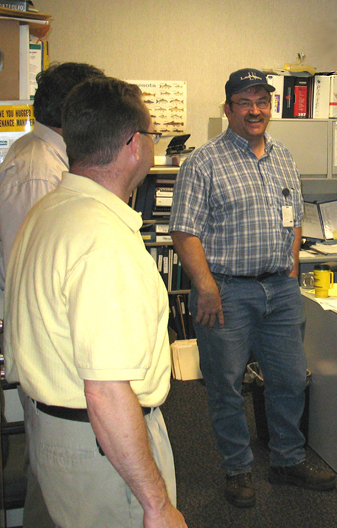 In 2001, he was promoted to engineering specialist and worked briefly with State Aid in the Central Office. Maack transferred to District 4 at Detroit Lakes later that year. He worked in the design area until 2006 when he was appointed as a supervisor. Visitation will be held from noon to 1 p.m. July 18 at the Olson Funeral Home in Fergus Falls. The funeral service will be held following visitation. Maack’s survivors include his parents, Elroy and Mary Lou Maack, a brother and a sister. "District 4 experienced a loss with the death of Steve Maack. Please keep his family in your thoughts during this difficult time,” said Mark Waisanen, assistant district engineer for program development. When Mn/DOT’s new bucket lift truck parks and hoists a technician to repair a light or a traffic signal, something unusual happens. Instead of idling, the 6.7-liter diesel engine shuts down. Power to operate the truck’s electric and hydraulic systems comes from a lithium ion battery mounted under the chassis. The battery is charged by a generator that transforms mechanical energy produced during braking into electrical energy. The truck can operate on battery power alone for about 2.5 hours until a recharge is needed. 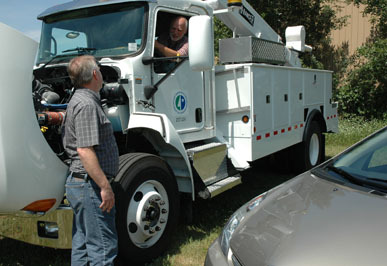 The truck is the agency’s first diesel-electric hybrid vehicle. The hybrid version of the truck gets about 10 miles per gallon of fuel compared with 5 to 6 miles per gallon for the standard version. The 3.5 ton-rated Kenworth joined Mn/DOT’s fleet in June. It’s operated by the Electrical Services Section based at Fort Snelling. 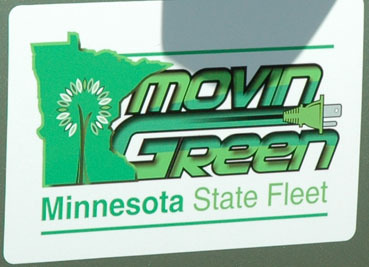 Randy Cameron, a supervisor at Central Shop, said the truck is the newest addition to Mn/DOT’s growing stable of hybrid vehicles. The fleet now includes three Ford Escapes, one Toyota Prius and a Chevrolet Tahoe SUV. The truck works much like the lighter, gas-electric hybrids. Its diesel engine stops running just as the smaller hybrids shut down their gas engines when stopped. The gas engines restart when the vehicle moves, getting a power boost from their electric motors. The motors provide large amounts of torque, enabling the hybrids to accelerate briskly or pass without using extra fuel. John Scharffbillig, fleet manager, Maintenance, said Mn/DOT continues to evaluate the hybrids’ performance to determine their effectiveness. Initial findings are promising, he said, noting the Escape hybrid gets about 35 miles per gallon, about 10 more than a standard Escape. Two of the Escapes, he said, are being retrofitted to use plug-in batteries. Plug-in batteries can operate at a higher charge level, providing a stronger power assist for longer periods of time. Plug-in hybrid batteries are charged by plugging them into a standard outlet when the vehicle is not in use. The Toyota Prius averages 41 miles per gallon in service as a pool vehicle for Central Shop staff. Steve Lund, state maintenance engineer, said the evaluations are being made under the umbrella of the Governor’s Next Generation Energy Initiative. Its mandates include cutting gasoline use by 25 percent and diesel fuel consumption by 10 percent by the year 2010. By the year 2015, the mandate calls for further cuts: a 50 percent drop in gas consumption and a 25 percent decrease in diesel fuel use. Lund said Mn/DOT’s use of renewable fuels and its initial trial with hybrids show promise. “It now costs more than $400 to fill the tanks of a snowplow truck,” Lund said. Mn/DOT is helping the Minnesota Department of Agriculture nab emerald ash borers—pesky insects that have killed 20 million ash trees in Michigan and thousands more in Ohio, Maryland, Indiana, Illinois, Pennsylvania and West Virginia. The MDA is hanging emerald ash borer traps on trees at 34 rest areas in Minnesota with the hopes of finding out if the ash borer has arrived in Minnesota. Traps are also being hung in state parks and at Twin Cities Metropolitan area municipal and county brush disposal sites. 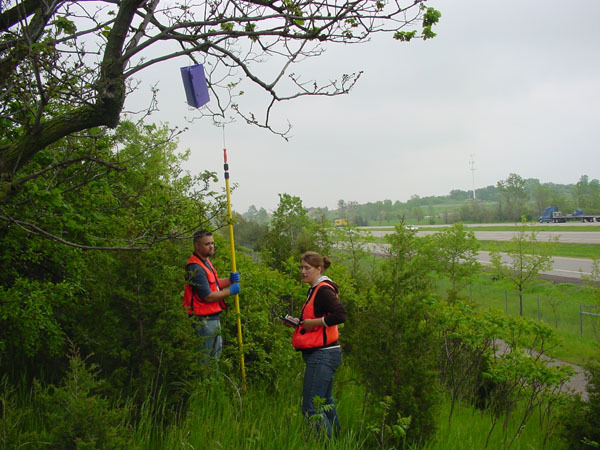 The roadside vegetation management unit in the Mn/DOT Office of Environmental Services, worked with Robert Williams, Mn/DOT rest area program manager, to set traps at Minnesota rest areas along busy interstates. The tent-shaped cardboard traps have adhesive interiors coated with a non-toxic chemical that gives off the same scent that a failing ash tree releases. This scent lures the pests inside where they get stuck. At the end of the summer, MDA staffers will collect the traps to see if any emerald ash borers were captured. All ash species in North America are susceptible to emerald ash borers. The pest was first introduced to the continent in the early 1990s. They are found in new areas each year. The problem is of such concern that the week of May 18-24, 2008, was designated “Emerald Ash Borer Awareness Week” in Minnesota. Don’t transport firewood, even within Minnesota. Buy the wood you need locally from an approved vendor. Don’t bring any extra wood home with you; burn it all at the site from which you bought it. Don’t buy or move firewood from outside Minnesota. If someone comes to your door selling firewood, ask them about the source of the wood. If it came from outside Minnesota, don’t buy it. Watch for signs of infestation in your ash trees. If you suspect you have found an emerald ash borer or see an ash tree you believe could be infested, visit www.mda.state.mn.us/invasives/eab. You will find a checklist (“Do I Have Emerald Ash Borer?”) to help rule out emerald ash borer. To receive a hard copy of the checklist contact the “Arrest The Pest” Hotline at 651/201-6684 in the Twin Cities Metropolitan Area or 888/545-6685 throughout Greater Minnesota.